At our practice, we’re dedicated to helping you recover from your procedure as quickly and healthily as possible. That is why we’re proud to offer our patients VitaMedica® Products that are designed to support you after surgery to lessen bruising & swelling. We also carry products that help restore intestinal flora to keep things moving through your stomach after post-op medication use and antibiotics. See which products we carry below and don’t hesitate to call us at (858) 450-1776 if you have any questions! Products are available for purchase in our office. Formulated with natural ingredients including Arnica montana, vitamin K, vitamin C and botanicals to improve the appearance of post-procedural bruising. 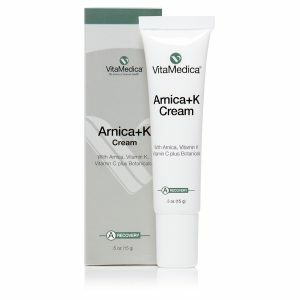 Arnica + K Cream softens, calms, moisturizes and restores bruised skin. Tube contains 0.5 oz. Arnica Montana is an herbal remedy that has been traditionally used for bruising. Clinical studies have demonstrated Vitamin K’s role in hastening the resolution of bruising after a cosmetic procedure or injury. For best results, take with Homeopathic Arnica Montana 30X tablets. Phytosome® plant sterols reduce vascular permeability, edema and swelling. Vitamin C ester, hesperidin, horse chestnut, comfrey and grape seed extract strengthen capillaries and improve micro-circulation to injured tissue. Chamomile cools, soothes and refreshes. Natural grapefruit oil imparts faint, fresh citrus scent. Free of parabens, artificial colors, and fragrances. Packaged in a convenient blister pack, Arnica Montana is perfect for busy, active lifestyles. Homeopathic Arnica Montana has been used for centuries to treat bruising, swelling and pain associated with soft tissue injury. Blister pack contains 30 tablets. Ideal after injectables & fillers (e.g., Radiesse®, Restylane®, Juvederm®). Homeopathic preparations have been used for centuries in Europe to safely treat a variety of conditions. All natural medication works without side-effects to gently stimulate healing. 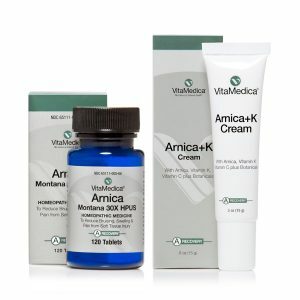 Arnica Montana plant organically grown in the mountainous regions of Western Europe and U.S. Single remedy medication excludes dyes or colorants. Arnica Montana 30X formulation eliminates the challenge in determining the appropriate product, potency, and formulation to buy. Sub-lingual tablets dissolve quickly without leaving a chalky taste in your mouth. Manufactured in the U.S. in accordance with the Homeopathic Pharmacopeia of the United States (HPUS). 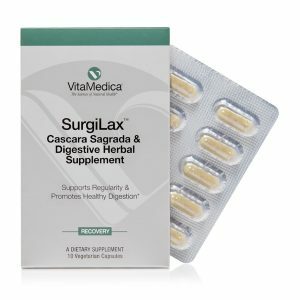 Cascara Sagrada & Digestive Herbal Supplement Dehydration, stress and reduced physical activity can work against your body’s normal routine of elimination and cause occasional constipation. Take control and address the problem naturally before it even starts! Blister pack contains 10 vegetarian capsules. Two-in-one herbal formula developed by an anesthesiologist for his surgery patients. Digestive herbs support digestive health and cascara sagrada promotes normal, regular, and comfortable bowel elimination. Formulated with 250 mg of cascara sagrada, a botanical traditionally used for its natural herbal laxative effects. Milk thistle helps eliminate toxins and excess waste and protects and promotes liver health, to assist your body’s natural detoxification process. Antibacterial herbs yellow dock, licorice root, oregano leaf, and Oregon grape provide balance and cleansing support. Bitter herbs burdock and dandelion stimulate digestive function and their high inulin content promotes growth of beneficial bacteria. Ginger and peppermint help soothe and calm your digestive system to minimize discomfort associated with occasional constipation. The high mucilage content of marshmallow coats, lubricates and soothes your digestive tract. Five-day blister pack with 2 capsules-a-day dosing provides convenience and ease-of-use. 100% natural product that is non-GMO and is suitable for vegetarians. Many factors including diet, travel, stress, and antibiotic use can disrupt the balance of bacteria in your gastrointestinal (GI) tract. 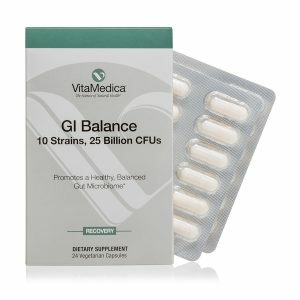 VitaMedica’s GI Balance is a balanced-spectrum probiotic formulated with 10 different beneficial bacteria species to get your digestive system back on track. Favorably alters the gut microbiome to promote healthy digestion and support immune system function. Daily dosing guaranteed to provide 50 billion CFUS of live beneficial bacteria at time of manufacture. Formulation includes Lactobacillus, Bifidobacterium, and Streptococcus beneficial species whose digestive and immune health effects are widely-documented. Twelve-day blister pack provides convenience and ease-of-use. A great companion while traveling abroad. Safe to use with antibiotics.